These little babies were well received at Book Club and work. So light, they couldn’t possibly have too many calories or be bad for you! Preheat oven to 350° and put mini cupcake papers in mini cupcake pan. 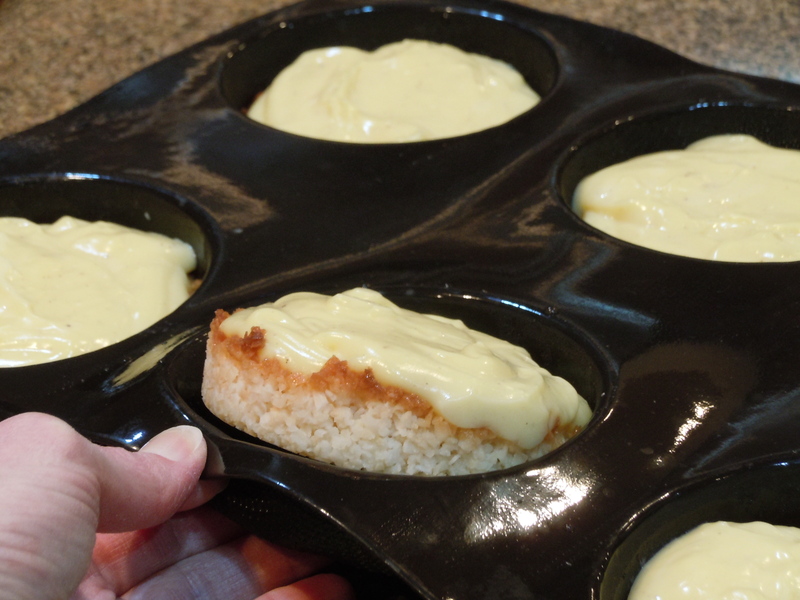 With electric mixer, mix cake mix, coconut, eggs, oil, and coconut milk for 2 minutes. Scoop batter into prepared cupcake pan, filling each cup about 3/4 full. Bake 15-18 minutes, until top is set and springs bake when touched. Cool completely before frosting. Makes approx. 48 mini cupcakes. Beat butter with electric mixer for 5 minutes until creamy lighter in color. Add powdered sugar, zest. Add enough food color, cream and juice to make desired color, consistency and taste. Pipe onto completely cool cupcakes, and dip frosted top of cupcake in bowl of coconut. I love coconut and cupcakes. These are pretty easy, a white cake mix with a twist. 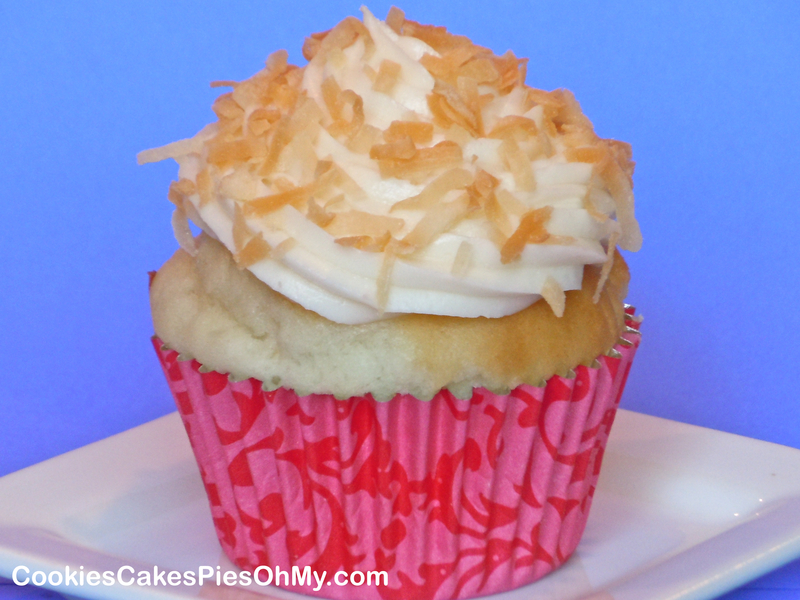 Very coconutty flavor, light and fluffy cake and creamy coconut cream cheese frosting. Preheat oven to 350°. Line cupcake pan with papers (makes about 18). In large bowl with electric mixer, whip cake mix, coconut milk, oil, coconut extract and egg whites until well combined. Evenly distribute batter between cups. Bake 18-20 minutes. Cool completely before frosting. Cream all frosting ingredients together adding 1 Tbl of coconut milk at a time to make perfect frosting consistency. Frost cupcakes and sprinkle with toasted coconut if desired. If you are interested in Demarle bakeware such as the Muffin Tray and Perforated Sheet please visit mydemarleathome.com/kristenparker or simply click on the Demarle at Home logo below. I have had this recipe on my “To Make” list for awhile, so today was the day. This is an adaptation of a recipe on thelunacafe.com. 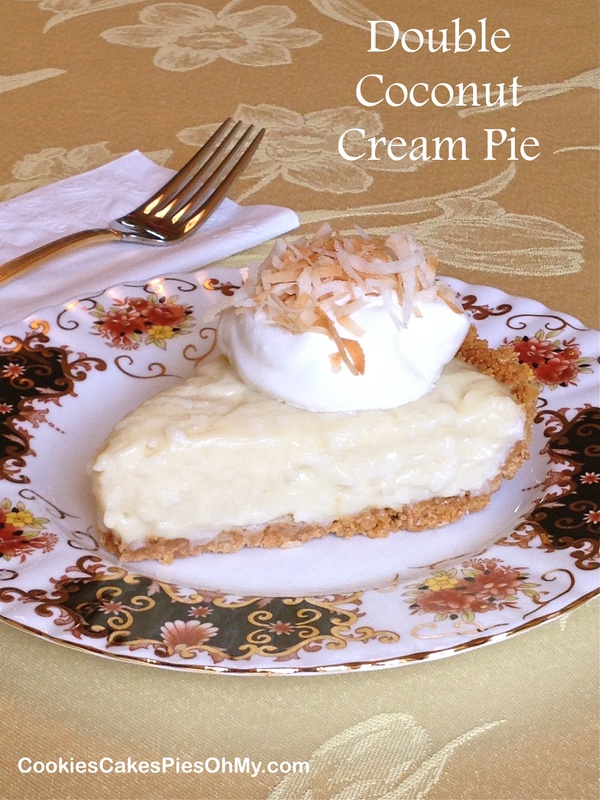 A beautiful pie with toasted coconut crust and white chocolate melted in the cream filling. Oh so good! Chop toasted coconut. Mix together coconut, sugar, salt, and melted butter. 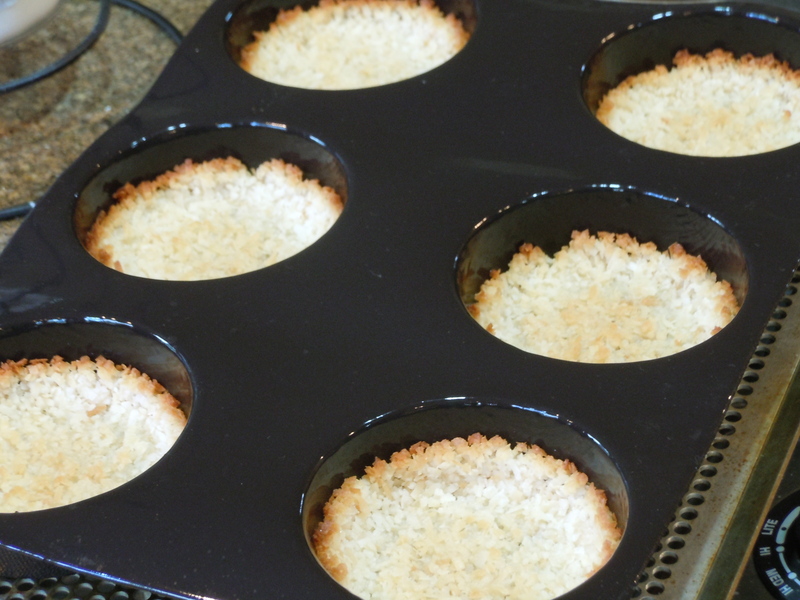 Press 1/3 cup coconut mixture into each round of Demarle round tray to make six crusts (or a 9” pie plate). Bake at 350 for 6-7 minutes for individual pie crusts (or 15 minutes for large pie), watch closely so as not to get too brown. Cool completely. In medium saucepan, whisk together sugar and cornstarch. Add milk, coconut milk, and vanilla bean or vanilla paste, whisk to mix well. Turn on heat to medium-high and stir constantly until thickens and begins to boil. Remove from heat. Ladle small amounts of hot milk mixture into egg yolks to warm gradually. Pour egg yolk mixture into milk mixture in saucepan, stir to combine. Place saucepan back on medium-high and bring custard back to boil stirring constantly for 1-2 minutes. Remove from heat. Stir in salt, vanilla extract, coconut extract, and white chocolate, stir until chocolate melts. Let custard cool to warm, stirring occasionally. 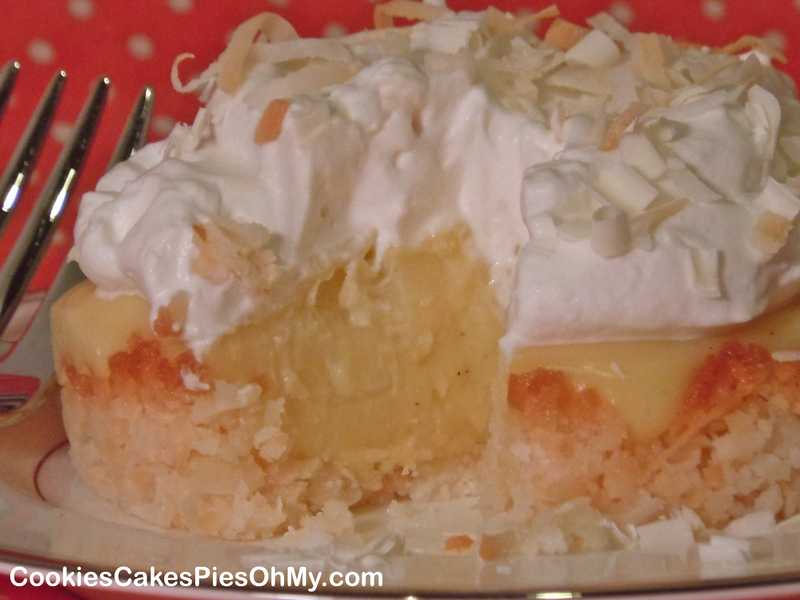 Fill each coconut crust with about 1/2 cup custard. Cover with Silpat, put in refrigerator to cool completely. 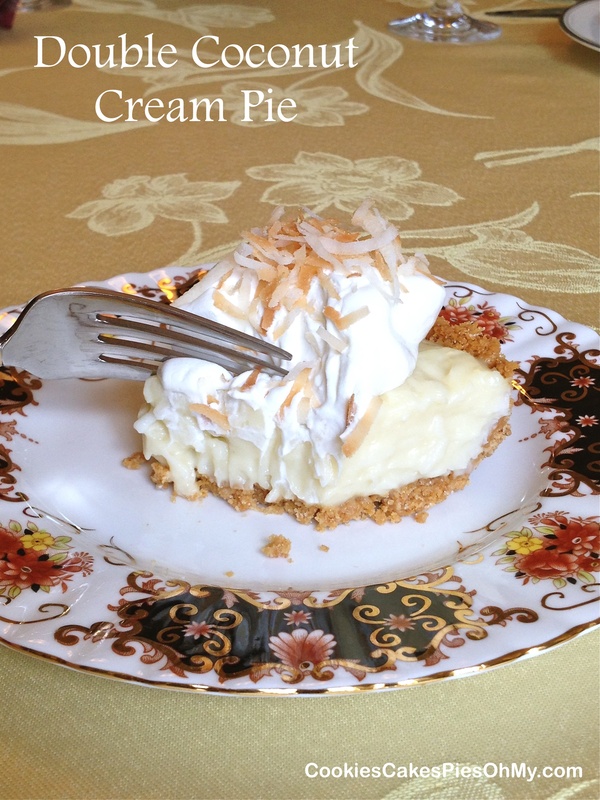 To serve, put each pie on plate, dollop with whipped cream and garnish with toasted coconut and white chocolate shavings. Whip cream with electric mixer to soft peaks, add powdered sugar and vanilla and whip to desired stiffness. If you are interested in Demarle bakeware and kitchen tools like the Round Trays and Perforated Sheets please visit mydemarleathome.com/kristenparker or simply click on the Demarle at Home logo below. 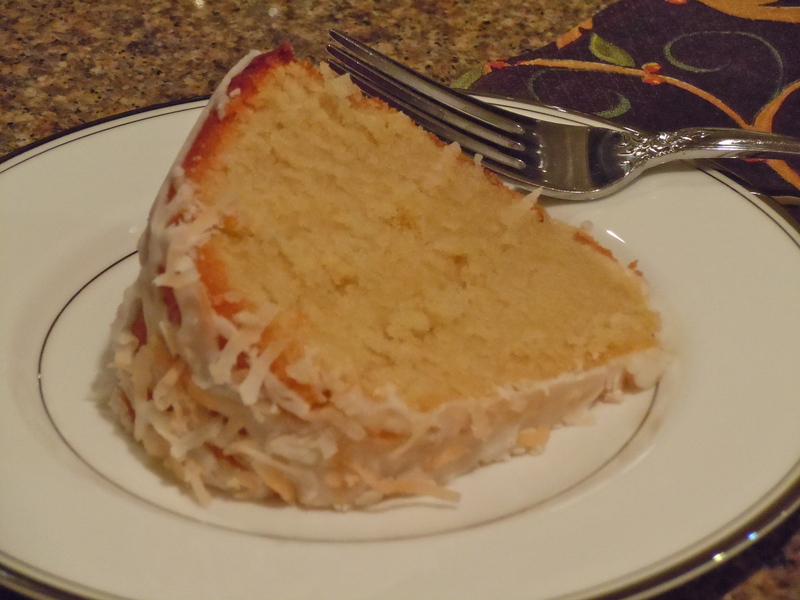 If you love coconut, I think you will love this cake. Bundt cakes are great because you mix up the batter, bake, sprinkle with powdered sugar or drizzle with glaze and you have beautiful presentation without a whole lot of work. What I love about finding a recipe on the internet is that usually there are comments. As you read the comments you get great tips as to what changes you might want to make. This is a recipe of the Neely’s on Food Network and as I read comments I decided a couple little changes I would make. This is a delicious, moist cake…love it! Happy Birthday to my wonderful brother Tyler! Preheat oven to 350°. Spray a Bundt pan with nonstick baking spray and dust with flour. In a large bowl, using an electric mixer, cream butter and sugar together until light and fluffy. Beat in eggs, 1 at a time. Add vanilla and coconut extracts. Stir in coconut milk and beat until combined. Slowly beat in the dry ingredients until the mixture is smooth. Stir in the chopped coconut. Pour the batter into prepared pan and bake until a cake tester comes out clean, about 50 minutes. Cool cake 5 minutes before turning it out onto a rack. Let cool completely. For glaze, whisk together powdered sugar, pineapple juice, and coconut milk, can add more milk or juice to make desired consistency. 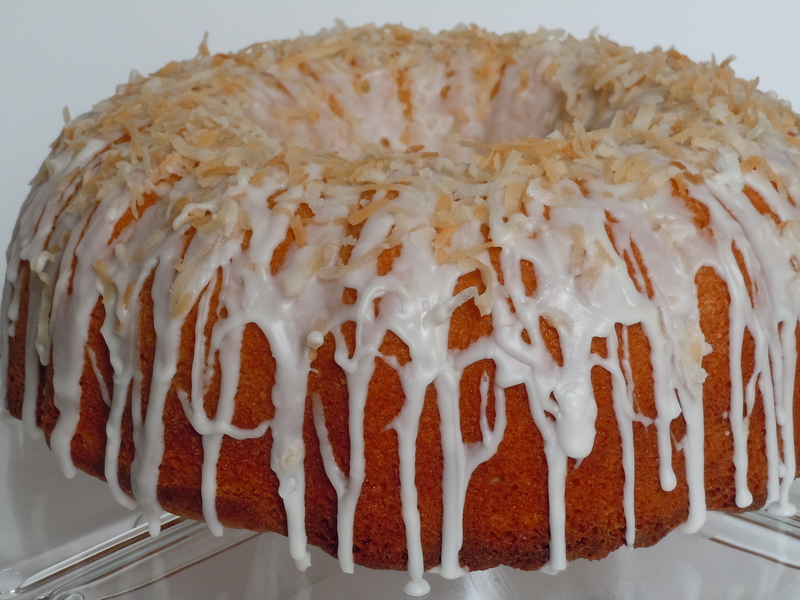 Drizzle glaze over cake and sprinkle with toasted coconut.